Did you see the report recently from the CDC (Centers for Disease Control and Prevention) about Arthritis? Amazingly 2 in every 9 Americans has crippling Arthritis. That’s the ‘average’ across all age groups. In older age groups it must be 9 out of 9, or very close to it! As usual, all of the so-called “wonder drugs” like Celebrex and Fosamax are pitifully useless and massively over-priced. But there is a NATURAL ANSWER, and just pennies a day. It’s like having the most famous Arthritis Clinic in the world, right in the palm of your hand, in pill form. Disease in America is so out of control, that the CDC has it’s own weekly report, grimly titled “Morbidity and Mortality Weekly Report“. The latest issue is sober reading indeed. 67 Million?! Some countries that don’t even have that many people! The driving factor for the rise in arthritis patients appears to be obesity, the researchers said. (Brought on by the typical American Diet of fast food and processed foods.) Among those who are obese, 33% of women and 25% of men have been diagnosed, roughly double the proportion among those whose weight is normal. The statisticians tell us that there are over 335 different forms or variants of Arthritis. Arthritis of the knee and other joints disables about 42% of those with arthritis, or 21.1 million people. (That’s more than the total population of my home country, Australia!) The total cost of medical and impaired activity to the U.S. economy is about $128 Billion annually. That is not a misprint – $128 BILLION, annually! The CDC says an additional 17 million Americans are projected to develop arthritis in the next 20 years, (that’s 67 million people) making it the most common cause of disability in America. 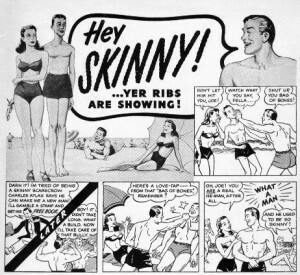 You are probably too young to remember the famous Charles Atlas bodybuilding ads of yester-year. A big muscle-bound bully would kick sand in the face of a meek, skinny kid on the beach, and the ad would then sell you on a course of body-building books and equipment. I remember them well, as I was always the skinny kid on the beach getting sand kicked in my face by the rippling muscle Adonises that the girls all flocked to. Well, today is my day to kick sand in the bully’s face! After an enormous amount of work, research, development, testing and re-testing, we are over the moon excited to release our plant-based, totally Vegan, Super Food formula, “Protein Plus“. This is a true world champion piece of nutritional food technology. And is precisely in tune with what the world is waking up to – ditching dangerous animal-sourced protein from dairy (milk, whey, cheese, ice cream and butter), as well as red meat, pork, chicken, turkey and seafood. But that’s just one part of the story, read on for the full documentation of what we believe to be the “Muhammad Ali” of Protein Supplements! It is one of the great fallacies of all time that we can only get protein from eating animals – beef, chicken, pork, turkey and fish. The fast-food giants would love you to think this of course. So too would the beef and cattle industry, the dairy industry and even the US Dept. of Agriculture (USDA) with their out-of-touch food pyramid.